LIVING LIFE SOURCE FOUNDATION (LLSF) is a charitable non-profit organization incorporated in the State of Hawaii in 2011 and awarded a 501 c(3) IRS non-profit status in 2012. Our LLSF mission is to restore a system of living by embracing all faiths and modern science; teach concepts vital to creating a life of greater meaning, purpose, and freedom; and, educate the people of Hawai`i to become self-sustainable and to perpetuate the life-force spirit of Aloha (grace, unity, gentleness, humility, patience, unconditional love, forgiveness, gratitude, mindfulness, generosity, happiness). Our LIVING LIFE SOURCE FOUNDATION (LLSF) inhabits a modern Hawaiian pu`uhonua (safe place) where Native Hawaiian education, healing, sustainable lifestyle, and natural farming intersect. 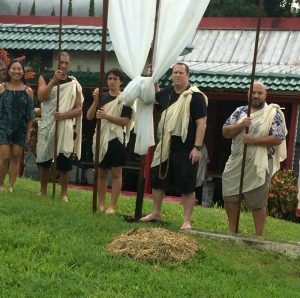 The vision of LLSF is to restore a system of living, which integrates rigorous Native Hawaiian cultural practice with contemporary science, and all belief systems. Through teaching concepts vital to creating a life of greater meaning, purpose, and freedom, with reverence for our natural land (`aina), ocean and sky environments, LLSF educates the people of Hawaii to become self-sustainable and to perpetuate the value of aloha. Programs and services offered to the general public are provided at the LLSF Healing Center for Wellness and Sustainability located in the historic valley of Mānoa, Oahu and community centers throughout the island of Oahu.